Learn How to Become a Personal Trainer & Start Your Own Business! So! You’ve decided to finally make the move and build a livelihood out of doing what you love most – building strength, fitness, and confidence in yourself and others. That’s great! Being a personal trainer can be fun, rewarding, profitable, and career-orienting, as it opens you up to related occupations, niche specialties, and entrepreneurial possibilities. We’ve created a guide to help prospective personal trainers become informed on the steps of accomplishing this goal – from understanding the various certification standards, to the process of opening your own business and securing clients. As with entrepreneurial ventures of all types, the key ingredient to success in the personal training business is passion, commitment to meeting goals, and investing effort correctly. We’re here to help you navigate the essentials, along with plenty other helpful tips and tidbits. The journey of a certified personal trainer can be long and challenging, but it needn’t be groping in the dark. There are specific milestones you’ll achieve, and it helps to know in advance what the personal trainer requirements are for specific certifications and in general, and what you can look forward to. In this guide, we’ll get into the nitty gritty of each phase, touching on highlights like choosing the right certification for you, registering and insuring your personal training business, what to expect as a gym employee and as a freelancer trainer, marketing your business, and much more. Read on, and good luck! While there are several respectable certifications available for personal trainers, we’ve briefly detailed what are generally considered to be the ten most well regarded. These are all recognized by reputable accreditation oversight organizations, so you can be certain that whichever you pursue will qualify you for employment pretty much anywhere. Selecting the right track for you is a decision to be made based on features, cost, requirements, and career path goals. Like everything else, the quick and easy route isn’t necessarily the best one – and too good to be true is often exactly that. The growing popularity of fitness and personal training has resulted in the creation of hundreds of different “certifications” – but as tempting as low price online certification offers may be, it’s important to do your homework. Many of these certifications are not accredited, and have no more value than the paper they’re printed on. The certification process can take from as little as six weeks to up to four years to complete, depending on the program, method, time invested, and fitness experience. There are certain requirements before beginning an accreditation course that are common to all legitimate certifying agencies. Applicants must be 18 years or older and certified in CPR and AED (automatic external defibrillator) delivery. This certification can be obtained through community education programs, or your local Red Cross chapter. In addition, having a high school diploma or GED is required by almost all certifying organizations. National Academy of Sports Medicine By numbers, NASM is the most popular certification out there. 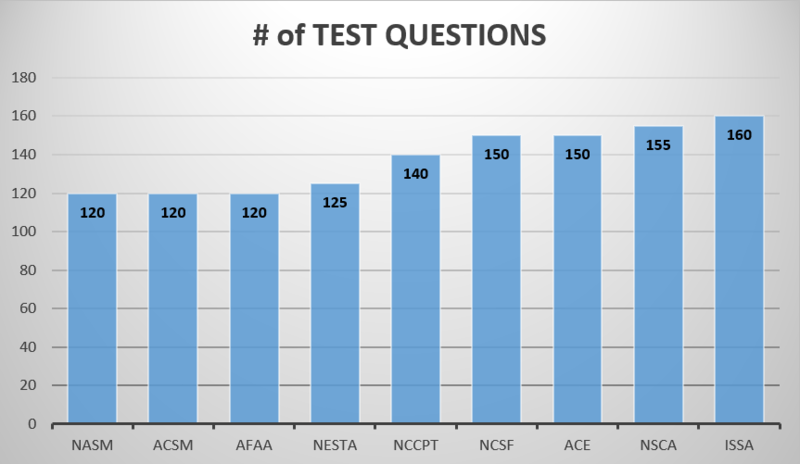 To become NASM certified, applicants must pass a two hour 120-question exam. The NASM personal training certification carries a total cost of between $800-$950, which includes a 9-week online prep course, interactive live workshops, and a pass guarantee. It is among the costliest certifications, but is well worth the investment, as NASM-certified PTs are among the highest earning. A variety of specialty credentials can also be added to the core certification. American Council on Exercise ACE is another excellent and very popular option. They offer several types of programs both on and offline, in addition to a personalized resource center that allows you to review or practice material with specialized counselors. ACE also offers group fitness instructor certification and weight management consultant certification. Prior to the exam, ACE offers a 2-day workshop to help with final studying. This ACE fitness certification will cost you approximately $600. International Sports Sciences Association ISSA provides certifications in fitness training, strength and conditioning, youth fitness, senior fitness, and many more specialized accreditations. Aiming for a comprehensive PT-molding program, the one-year program also includes a marketing and business guide, which is great for tips on how to build your business once you’ve become certified. ISSA even has partnerships with top health clubs and gyms to ensure that their personal trainers are seamlessly employable from the get-go. ISSA certification comes with a price tag of about $500. American College of Sports Medicine One of the oldest accreditors out there, ACSM was established in 1954 and is still among the top PT certifications. It offers multiple options for exam preparation, including 3-day workshops, 1-day workshops, and online webinar courses. ACSM personal training certification is considered among the most challenging exams, and costs about $520. National Strength and Conditioning Association Founded in 1993, NSCA is also considered one of the more challenging certifications. The course material is particularly wide in scope, including client assessment, modifications for special populations, and a broad array of exercises such as aerobic, plyometric, and speed training. Holding a Bachelor’s Degree or being currently enrolled in a B.A. program is required for the program, and many students work as CPTs while pursuing academic degrees in the health and fitness fields. NSCA certification is on the pricey side, costing upwards of $700. American Fitness Professionals and Associates AFPA provides a variety of certifications in fitness training, wellness, nutrition, health, and physical education. The AFPA was founded to create an educational environment for those interested in fitness and offers educational courses and materials in a distance learning setting. AFPA is nationally accredited and internationally recognized. The cost of the certification program is $449. National Federation of Professional Trainers NFPT has been providing personal training education and certification since its establishment in 1988. The program requires two years’ experience with weight, resistance, and cardio training. Standard NFPT certification costs $425 and includes exam prep materials and the exam fee. Members must renew their membership yearly. National Exercise & Sports Trainers Association NESTA has been in business since 1992 but only recently received accreditation by the NCCA (National Commission for Certifying Agencies). Thus, those considering this certification should verify its validity with their desired place of employment. NESTA places a strong focus on the business side of personal training, providing education and resources to bridge the gap between receiving instructor certification and managing a personal training business. Interestingly, NESTA recently integrated technology into their training through a partnership with tech company Polar for real time heart rate monitoring. The fee of NESTA certification is $449. International Fitness Professionals Association IFPA offers different levels of certification, including basic, advanced, and master trainer certifications. The basic certification focuses on general knowledge in exercise science, physiology, and client assessment. Dozens of specialized and niche certifications are also available. The fee for taking IFPA’s exam is $349, with higher levels of training materials and services available at additional costs. Athletics and Fitness Association of America AFAA is the world’s largest fitness and TeleFitness educator. The AFAA certification can be obtained entirely online, but completing the ‘real life’ exam preparation and review is encouraged. The certification program is geared toward training healthy clients of varying fitness levels as well as nutrition, behavior modification, and communications skills, and there is an additional certification available for group exercise instruction. The cost of AFAA certification is $499. For those of you who are military veterans, there‘s good news when it comes to personal trainer certifications. At Next Insurance, we salute you for your service, and we’re pleased to let you know that our partner, the National Academy of Sports Medicine (NASM) does too. They participate in a VA initiative to offer a fee reimbursement for certification exams and licensing. This means that any veteran with a NASM Personal Trainer Certification going back to March 1, 2001 is eligible for the VA fee reimbursement for the costs of licensing and certification exams. NASM also goes above and beyond by providing extra discounts to all members of the military. Whether you passed the exams or not, you may be eligible, so it’s worth looking into. If you think this offer may be relevant to you, check out more details on how to apply for benefits and how to access the reimbursement. Other personal trainer certification organizations may offer similar discounts, so it is worth checking with the individual organization if that’s relevant to you. When fitness trainer certification exam time rolls around, it’s perfectly normal to become as nervous as you might be when taking any other academic exam – perhaps even more so, as you’ve likely spent a year or more in preparation. Naturally, you’ll be drawing significantly on your own fitness experiences and knowledge as well as the study material provided by whichever certification program you’ve chosen, but here are some tips on how you can best prepare. Get supplementary instruction on anatomy. Many courses will assume a thorough knowledge of relevant anatomy and gloss through important terms and concepts in passing – so it’s best to arm yourself with anatomical/muscular basics before or during CPT studying. Anatomy coloring books are a fun and engaging way to lean this material. When reviewing the vocabulary words of fitness physiology, go one step further than the standard flash card method – make sure you know the concepts behind the words, and how they are interconnected and applied! Some fitness instructor certifications make it a point to test your knowledge of the legalities involved in fitness training, including insurance and liability. Although this may seem peripheral to the main point of learning fitness and how to train, it’s crucial to be well versed in applicable local and federal laws. Take as many practice exams as you can! Seeing the material you’ve been crunching in the question/answer (usually multiple choice) configuration that you can expect to see on the real thing will help you mentally prepare to condense the material into exam format, and get a feel for the pressure of taking the exam as well. Most people studying for personal training certification are occupied with other things as well, be it school, work, family – or all three. For this reason, it’s important to establish a set study schedule and stick to it as closely as possible. Of course, there are a million factors involved in how much time you’ll need to allocate for yourself, including previous training knowledge and the details of your schedule. Creating the goal of one chapter a week, for example, will help keep you on point. As mentioned above, in addition to a basic personal trainer certification, there are several specialty certifications that can be added to your license. Many of them, including group fitness, elderly training, adolescents, pregnant women, professional athlete training, and youth training are available as supplementary credentials through the various certifications. Also, most include CEC value points, which will be discussed more below. Here’s a quick rundown. Credentials offered by NASM include mixed martial arts conditioning, golf fitness, women’s fitness, youth exercise, and fitness nutrition. Through ACE, you can be certified as a group fitness instructor, ACE health coach, or advanced health and fitness specialist. ACE also offers several specialty certifications, including youth fitness, fitness nutrition, functional training, and mind-body. ISSA provides certifications in fitness nutrition, exercise therapy, senior fitness, youth fitness, strength and conditioning, and sports nutrition. You can also gain upgraded personal trainer credentials through their elite trainer and master trainer certifications. ACSM offers a wide variety of certifications, including group exercise instructor and health fitness specialist, which gives you the skills to work with populations with controlled medical conditions. Clinical certifications are offered, as are specialty certifications, such as exercise as medicine, physical activity in public health, and cancer exercise trainer. Because the NSCA is primarily focused on strength and conditioning, they offer certifications related to this field, including special populations certifications. They also offer a program for certifying tactical strength and conditioning facilitators, who train military, law enforcement, fire and rescue, and other specialty fields. AFPA’s specialty certifications include youth, elderly, and special populations, but also place emphasis on alternative school like yoga, Pilates, and nutrition. NFPT offers in-depth certification courses focusing on advanced fitness. The courses, which include fitness nutrition, endurance training, and resistance training, complement the basic certification. NESTA offers supplementary certification in fitness, personal training, nutrition, weight management, martial arts, and much more. There is even a course on how to get better at business and building your PT brand. There are dozens of advanced certifications available through IFPA’s programs. They touch on pretty much all aspects of fitness and health, including obesity specializations, sport management, yoga, lower back, dance, group fitness, and much more. AFAA also offers a wide variety of specialty options to help their trainers grow in expertise, knowledge, and value. These include metabolism training, emergency response, dance, indoor cycling, kickboxing, and more. Many certified trainers become interested in specific popular fitness and health trend niches, categories which can become careers in their own right. Achieving certification as a yoga, Pilates, or spinning instructor, just to name a few examples, positions you as an expert in a specific area – which is a great advantage in jump starting your business. These classes are often delivered to groups, rather than individuals, which is a current fitness trend preferred by many instructors. Naturally, one does not simply achieve certification and then stop reviewing and developing. Particularly when your job involves teaching others to push against their physical limitations – which always carries the risk of error and injury – it’s vital to stay sharp in knowledge and practice. For example, personal trainers are required to keep their CPR and AED certification current. Additionally, each certification type requires continuing education credits (CECs), and while they are all generally similar in recognizing conference attendance, specialized courses, and accredited webinars, the actual requirements vary for each certification. Here are the essential requirements of re-certification for the above accreditations. NASM, ACE, and ISSA all require 20 CECs within two years, which is also the length of time after which re-certification is required. AFPA requires 16 CECs, AFAA 15, and IFPA requires 24, also within two years. They each offer their own menu of online courses, in-person workshops, and branded yearly conferences to keep their certified trainers sharp and primed. NASM and AFAA re-certification costs $99, but there is also the option of paying $299 at certification, which will cover all subsequent re-certification fees for life – a no-brainer if you are considering a long-term career in personal training. 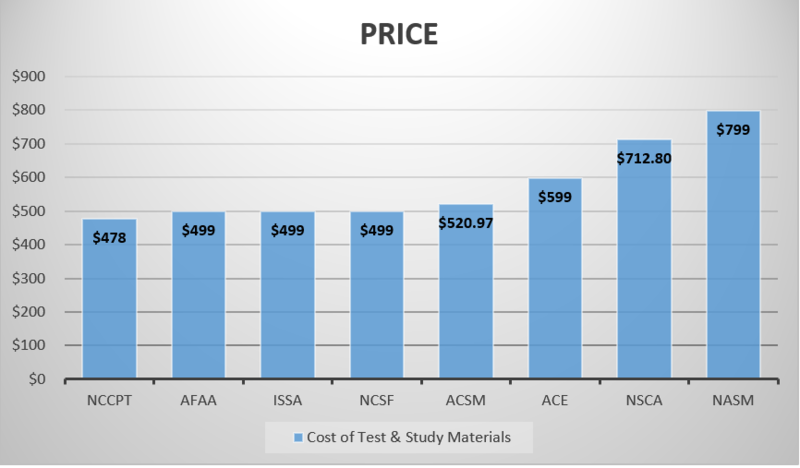 ACE re-certification costs $129, AFPA costs $85, and ISSA’s costs $75. IFPA re-certification costs $349. NFPT requires re-certification annually, but does not require any CECs for the first year. After the first year, two CECs are required, but NFPT offers free CEC credit opportunities online. They also accept health, fitness, and business learning opportunities from outside agencies for credit. The cost to recertify is $85 per year. NESTA only requires re-certification every four years. Four CECs are required over that period to keep trainers focused and sharp. The cost to renew is $149, and must be submitted 90 days before the renewal deadline. The list of agencies from which NESTA accepts CECs can be found on their website. ACSM and NSCA offer the least expensive re-certification, at $30 every three years and $50 every two years, respectively. ACSM, however, demands the most rigorous continued education, with 45 CECs required over three years. But helpfully, they do accept credits from other health and fitness agencies. NSCA accepts the standard 20 CECs per re-certification period (two years). Before you officially open your own personal training business and kick-off with your first clients, there are some important requirements that must be completed to ensure legitimacy and legal protection. In addition to certification from a nationally accredited program, your business must also be registered through the state government and state and federal revenue agencies. Doing this will allow you to obtain an official business license. Be proud, hang your license up on the wall next to your PT certificate! Whether you’re working completely independently or on staff at a gym, if you’re seeing private clients, liability insurance must be purchased. Most gyms require private contractors to show proof of insurance before they can start training clients, and insurance gives personal trainers the confidence they need to focus on what they’re great at, and to build their business. Taking the steps to becoming insured is an intimidating prospect for lots of trainers, but don’t worry – with new technology at play, this process can now be accomplished quickly and painlessly. Next Insurance specializes in Personal Trainer Insurance, with a policy that is designed specifically for the needs of personal trainers, covering liability issues like client injury, harmful dietary advice, client dissatisfaction, and more. Coverage can be obtained instantly and affordably online with policies starting at just $11 per month. Next Insurance even provides unlimited certificates of insurance, free of charge – so that you can authenticate your insurance status whenever you need to, and get back to work. Nearly all large gyms have a “locate a gym near me” option on their website – simply enter your zip code and a list of locations and their proximity will appear. When starting out in the personal training field, your best bet is to work at a gym. In addition to meeting potential clients and “building your book,” working at a gym is a solid way to keep your overhead costs down while starting out. It’s also a good opportunity to mingle with other more experienced trainers and learn from them about personal marketing, client management, and other tricks of the trade. Typically, commercial gyms have an arrangement with their PT staffers where trainers serve as employees of the gym, providing general assistance and workout regimes to gym members, and can also meet with their own private clients using the gym’s premises and equipment. With quality certification and a healthy work ethic, your fitness instructor certification holds great potential for business ROI. On average, full time personal trainers in the U.S. start out earning approximately $38,000 per year, with earning potential of $130,000+. Trainers with over three years of experience tend to make between $50k-58k/year. And for when you eventually start working with private clients and small groups, here’s some info on how private sessions work. Private sessions generally take 30, 50, or 60 minutes, and are billed at anywhere from $45-$100 per session. Price per session can be brought down by $5 or so for multi-session packages, which are advantageous to both you and the client. Most trainers prefer repeat clientele on regular days each week. It’s best to ask fellow trainers in your area what the usual going rate is, as they tend to fluctuate broadly based on region and experience of the trainer. It’s common practice to add about $15 for private sessions at your client’s home. Group sessions are most effective when capped at seven to ten participants, and the average going rate is about $15-$20 per person – also depending on location and experience. Being completely self-employed as a trainer is challenging and requires lots of perseverance, but can be tremendously rewarding. If you’re not ready or able to take the plunge and purchase and equip your own training space, many commercial gyms offer private space for rent, some equipped with training gear and some not. Ultimately, the sky is the limit: with enough experience, commitment, and marketing savvy, you could eventually open your own gym or studio – just one of the scenarios where personal training can be highly lucrative. GoSTATZ is a one stop solution intended for use by an entire gym staff, which includes tons of organizational functions including schedule and client management, nutrition tips and plans, and FitBit synchronization. The app even allows for on-the-spot credit card payments using STRIPE. GoSTATZ offers a lite version for free, and paid versions range from $27 to $77 per month. Another good option is RhinoFit, which is also useful for multiple staff members and can be accessed across all devices. RhinoFit offers membership and class management, in addition to email campaign and automation software. For $57 per month, the app includes unlimited trainer membership, but there is a free option for smaller gyms or private users. Chat with clients, add exercises, and track progress with TrainerFu. This app provides a clean platform for personal trainers to create workout plans and manage different clients’ nutritional needs and fitness goals in one place. The app costs $27 per month for a personal trainer, $59 per month for a studio, and $119/month for a gym staff. The Training Notebook is an easy-to-use and affordable app with a straightforward workout builder and client information management system. It comes with an appointment calendar and includes an interval timer for use during sessions to keep track of progress. This app has a one-time download cost of $15 – a good fit for budgeted trainers just starting out. Trainerize helps manage the paper trail that comes with a personal training business. Trainers can easily add attachments, notes, custom meal plans, and even flag injuries on a client’s profile. The app supports payments using PayPal, Shopify, and STRIPE. Trainerize is extremely popular in the fitness community and boasts 25,000 trainers and studios. The cost is free for a limited number of clients, $18 per month for a studio, and $54 per month for an unlimited number of clients. Lastly, the importance of cultivating clientele through successfully marketing your business cannot be understated. Without clients, your business cannot succeed! Here are some tried and true tips that will help you get out there and start building a reputation – not to mention client roster. Develop an online presence. Create a free website using easy online tools such as Wix or Squarespace. Your site doesn’t need to be too fancy; a landing page with a brief bio, photos, certification info, and how you can be contacted should suffice. Use social media, and become savvy in posting imagery, promotions, and other content. Create a word-of-mouth and “recommend a friend” campaign. It’s fairly simple to build a name within the gym orbit, especially if you are a good trainer with great interpersonal skills. Consider campaigns such as offering a discounted session to existing clients as reward for recommending new ones. Word of mouth marketing is incredibly powerful. Ask your gym for referrals. Most gyms have an advertising area of some kind where people can post their services or needs, and a friendly heads-up to your gym’s managers that you’re available for training sessions is always a good idea. Keep your clients happy. Establishing quantifiable, accurate, and attainable fitness or weight loss goals for your clients is essential to keeping up their enthusiasm – and maintaining them as clients. Getting in shape is hard work, and its important both to manage expectations and highlight results. Don’t shy away from putting pressure on clients who are habitual session-cancellers. They must know that progress can only be made through committed regular training. Be your brand! It will require some capital investment, but coming up with a brand logo and having it imprinted on your own gym shirts and other apparel identifies you with your business – and invites people who may be interested in hiring a personal trainer to approach you directly. Becoming a successful trainer requires education, hard work, and dedication to the health and welfare of one’s clients. The goal of a personal trainer should be to help their clients identify and achieve fitness goals, while always ensuring best professional and safety practices. A successful personal trainer is one that motivates their client to achieve the best version of themselves that they can be, providing top relevant and expert advice in a motivational and highly personable manner. If becoming a fitness expert and certified personal trainer is your goal, it is entirely attainable with the right knowledge and preparation – and can yield deep satisfaction and career achievement, physically, mentally, and financially. Do I need to choose a personal training specialty? Personal training can be a crowded space, so it helps to stand out by earning supplementary certification. Working with children, seniors, or special needs people are great options, as is certification in specific fitness fields such as Pilates, yoga, etc. It’s never a bad idea to develop expertise in more fitness fields. Are there prerequisites required to become a personal trainer? Almost all certification programs require the applicant to be 18+ and certified in cardiopulmonary resuscitation (CPR) and the use of automatic external defibrillator (AED). In addition, having a high school diploma or GED is required by almost all certifying organizations. You can take a look at our ACE certification review, AFAA certification review, our NASM certification review, our AFPA certification review, our NFPT certification review and our NSCA certification review for help making the decision about which certification is right for you. Do personal trainers need to be insured? Yes. Most gyms require their trainers to show proof of insurance before being hired. Whether working as a gym employee or freelance trainer, being covered is vital against sudden legal issues such as client injury, harmful nutritional advice, or even allegations of sexual impropriety. Not fun, but hey – it happens. How long is the process to become a personal trainer? It really depends on your existing level of knowledge and experience. In most cases, obtaining personal trainer certification will take between two and four months. In certain cases, such as in conjunction with an academic degree, certification can take a few years. How much does it cost to become a personal trainer? Pricing varies per certification and accompanying materials, but most programs fit into the $400-$800 range, including materials. How much money do personal trainers make? Personal trainers just starting out earn approximately $38k per year. With a few years’ experience under their belt, trainers can make upwards of $50k – and this is not counting those who start their own successful gyms. Every fitness trainer certification requires recertification of some kind, which makes sense: as a personal trainer, your clients must be reasonably confident in your freshness and knowledgeability. In addition to keeping CPR and AED certification current, trainers are required to gather continuing education credits (CECs), the specifics of which vary for each certification. There is also a recertification fee usually required every two years which ranges broadly from $25-$75, depending on the program. Once I’m certified, how do I get clients? Networking is important, especially at the early stages of your personal training career. Many gyms have an announcement board where you can post your availability, and printing up business cards and styled workout gear with your brand logo will help. Be sure to post on the relevant online sites and utilize social media, too. Don’t be ashamed to self-promote – but do it tactfully! Should I utilize social media? Definitely. Set up a business-oriented Facebook and Twitter account. Post content every couple of days, featuring relevant articles and photos of your training area and clients (with permission). Gym selfies are ok too – but don’t overdo it! Social media is also great for promotional campaigns and deal offerings. Plenty of useful guides can be found online to help you plan and execute your social media marketing. What personal characteristics are important to becoming a trainer? Personal trainers must be knowledgeable, trustworthy, friendly, confident, and care deeply about the progress of their clients. Naturally, being in great shape is crucial, and finding the right balance between challenging yet not overworking your clients is the sign of an excellent personal trainer. What type of careers can fitness trainer certification lead to? Having started out as a gym fitness instructor, you can expand into group training and specialties, and from there, the sky is the limit. Being a CPT can lead to a career in law enforcement, public health, professional sports, or even fitness entrepreneurship like opening your own gym. Which personal trainer certification is the best? This is a tough one to answer – certs have their own pros and cons and should be evaluated individually. Having said that, the NASM, ACE, and ISSA certifications seem to be the best known and most popular.